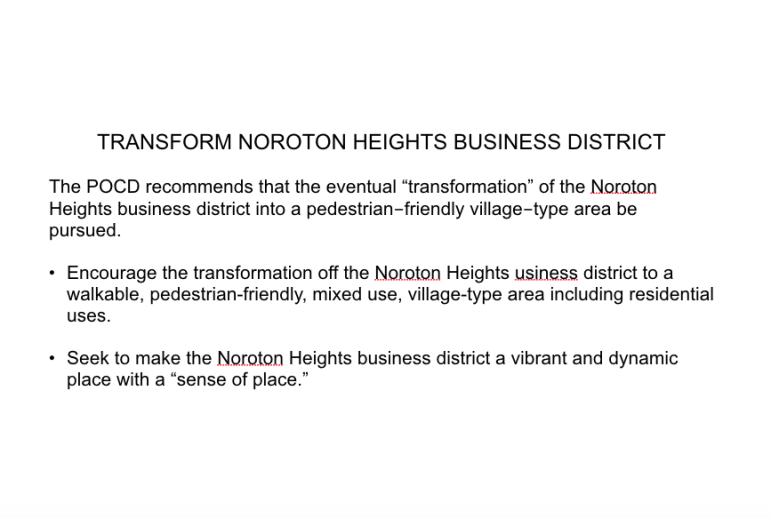 The two developers aiming to transform the Noroton Heights business district with major redevelopment proposals formally presented their ideas for zoning changes in the area and gave another description of what their projects would look like, with some revisions. 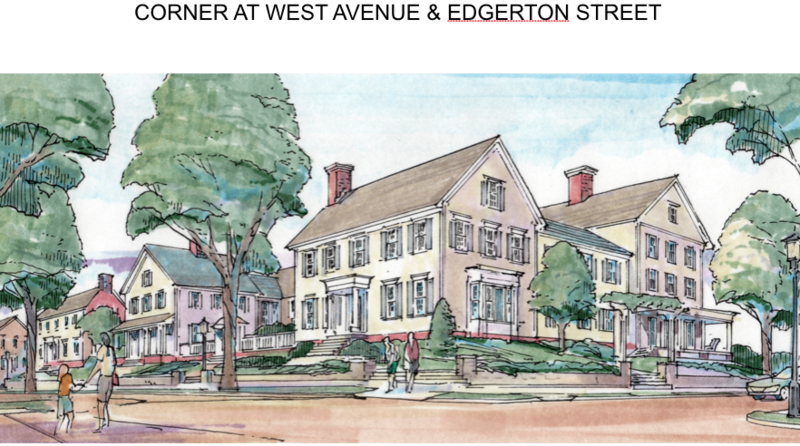 A pedestrian entrance from West Avenue closer to the middle of the block between Edgerton Street and Noroton Avenue has replaced the idea for an entrance on the corner of Edgerton and West Avenue. A pedestrian entrance from Noroton Avenue would have a small pavilion. 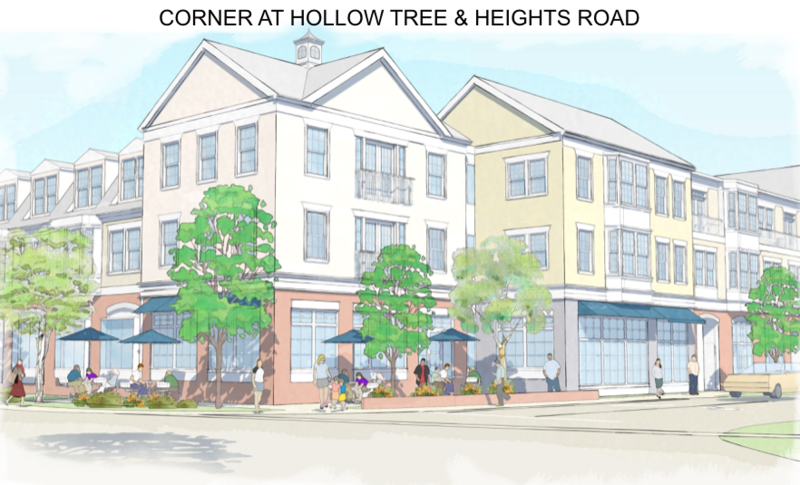 At the corner of Heights Road and Hollow Tree Ridge Road would be a small outdoor dining area. 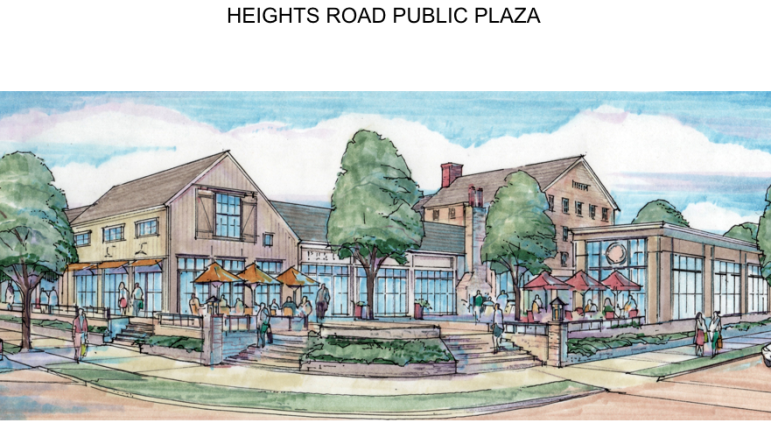 The main outdoor plaza on the Palmer’s property (roughly south of where Jimmy’s Southside Tavern is today) would be roughly 100 feet by 70 feet, said Architect Joseph Schiffer of Newman Architects New Haven office. It could include a large public clock on one building, a water fountain and even plaques telling people about the history of the site. Some planning & Zoning Commission members who were given the presentation — Chairperson Susan Cameron and member John Sini — indicated they were concerned about the number of stories for some of the buildings being proposed. Here are slides from Tuesday's presentation by developers of both the Palmer and Federal Realty redevelopment proposals. This set of slides concentrates on the slides about the Palmer property. 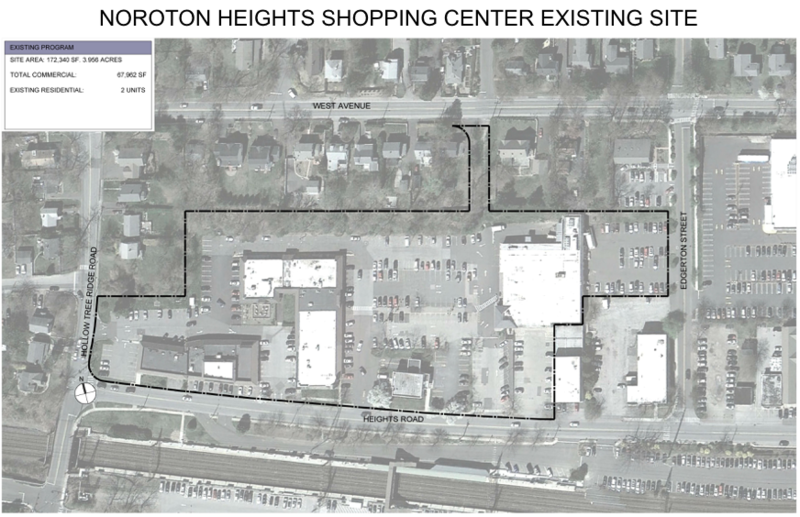 Map of the present site, which takes up most of the blocks between Heights Road (to the south), Hollow Tree Ridge Road (west), West Avenue (north) and Noroton Avenue (east). Buildings in and near both projects that will remain are in darker purple, new buildings are in lighter purple. The Palmer Family property as it exists now. 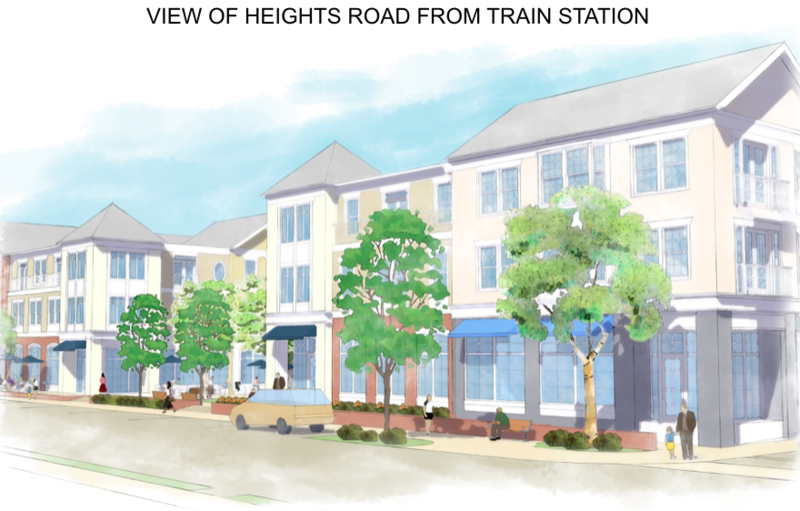 Conceptual rendering, proposed streetscape on the Palmer's side, along Heights Road, would have parallel parking, trees, planters, broad sidewalks. At this spot there might be a coffee shop with outdoor seating, one of a number of possible public spaces where people can meet. The building heights gradually lessen to the left, going north up Hollow Tree Ridge Road. 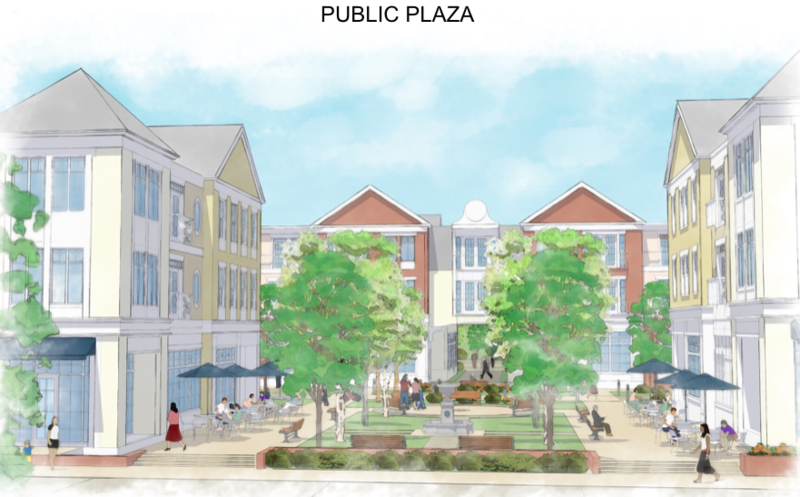 Looking north from Heights Road toward the largest public plaza of the Palmer's proposal, VERY roughly where Jimmy's Southside Tavern is, along with the surrounding area. Looking south and a bit east from the same public plaza on the Palmer's family property. From the same public plaza. 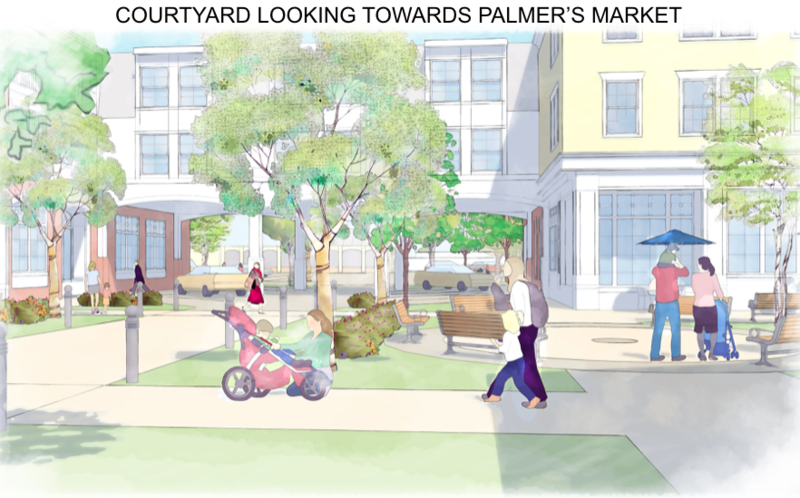 At the northern end of the plaza on the Palmer family property would be an arcade underneath the second and third floors of a building with residences on those levels and stores on the street level. The developers want to raise the allowed number of stories of buildings from three to four and the allowed height from 45 feet to 55 feet (commission approval would still be needed for specific buildings, and the developers are proposing higher buildings for areas farther from the streets). Cameron and Sini both talked about the historic intent of the commission when the earlier “overlay” district was approved, allowing higher building heights of up to three stories and 45 feet. Sini asked how the present height and story proposal was in keeping with a “commentary” document and in the Town Plan of Conservation and Development for 2006. Hill, who worked on the Noroton Heights project under the previous owner of the Federal Realty property, Thomas Golden, said the intent of the Planning & Zoning Commission as expressed in those documents was that the general concept of higher building heights in return for other amenities provided by developers (such as public spaces with benches) was maintained in the present request. Hill said the commission in the last town plan hadn’t intended to foreclose the option of somewhat higher structures. 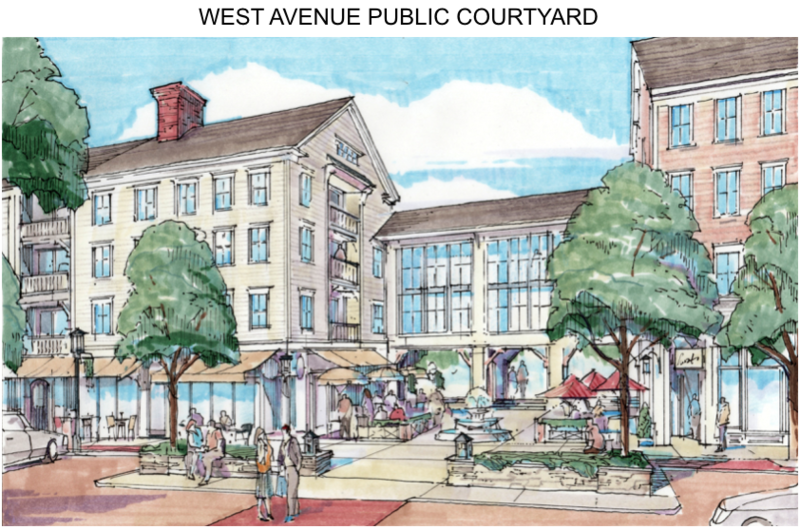 Despite all the maps and renderings of buildings presented to the commission, the detailed application for a zoning variance to develop the property is still in the future. 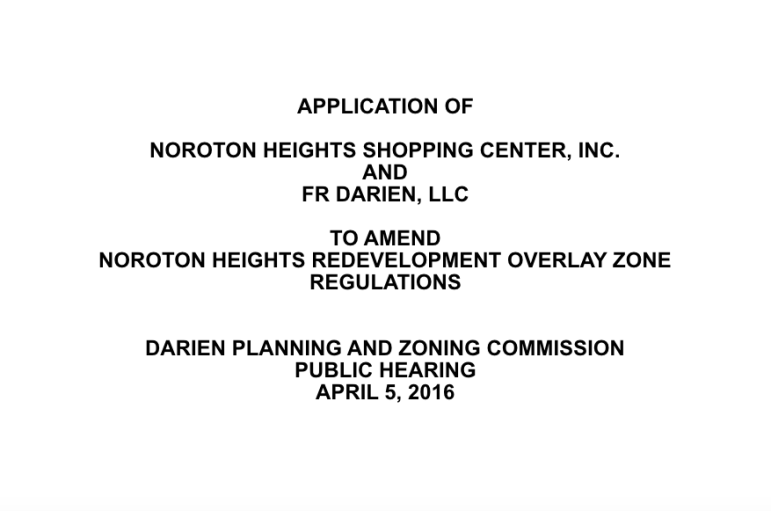 Tuesday night’s meeting of the P&Z Commission was meant to hear a proposal to change some zoning requirements for the area. 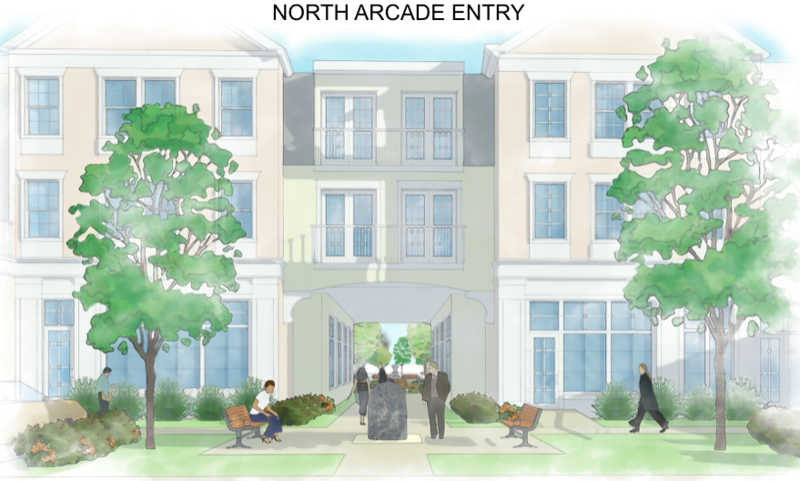 One member of the commission, Eric Voigt, asked whether the developers could do more to give a feeling of connectedness between the two developments, along with more pedestrian access between the two across Edgerton Street. 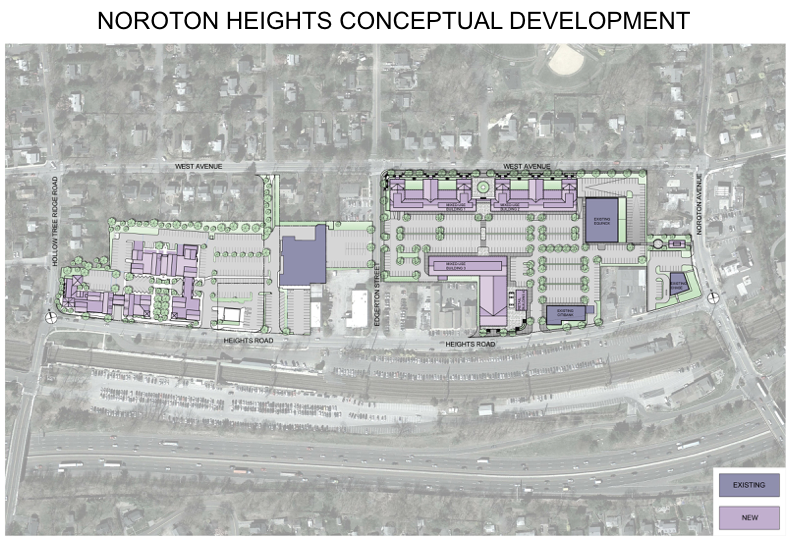 Hill answered that it was difficult to do much with Edgerton Street since the properties at the south end, on either side, were owned by neither of the land owners who are redeveloping. Additional sidewalks to People’s Bank and on the other side of the street might help, he said. 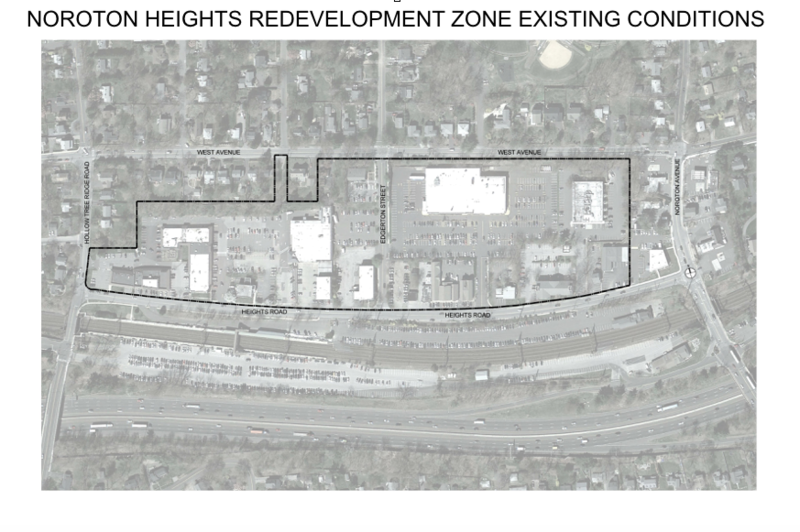 Sidewalks along Heights Road are being contemplated, Pather said. Consultants for the upcoming Town Plan of Conservation and Development had suggested that the town could aggressively push property owners to redevelop Edgerton Street to make it an inviting “entrance” from Noroton Heights Train Station into Darien. A new station house could be located just south of the Edgerton/Heights Road intersection to complement a road with storefronts on both sides of Edgerton, they said, and side entrances to both the Palmer and Federal Realty properties could also flow into Edgerton Street, they said. Another commission member, Richard DiDonna, said he wanted to be sure that the full 5 percent of promised public open space in each development was being followed. Traffic and drainage studies and proposals are still being worked on and will also come before the Planning & Zoning Commission for decisions later. When the business district was originally created in the late 1950s, it was meant to be a secondary shopping area that residents would access by car. 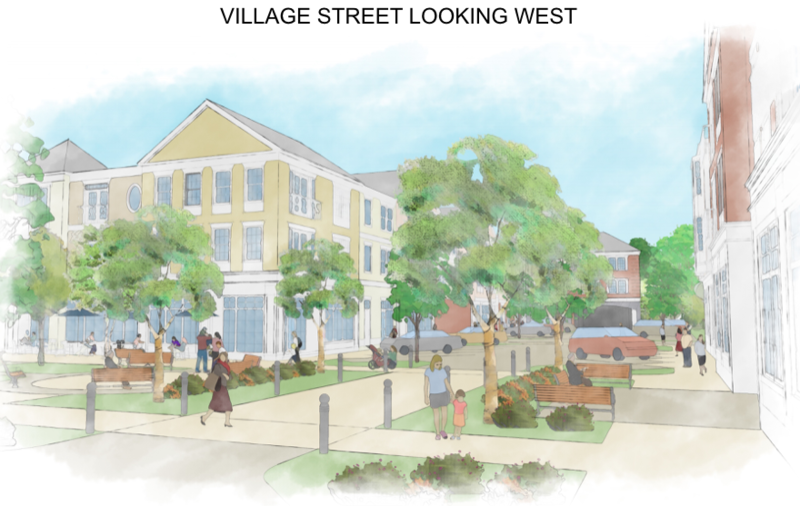 Nowadays, public officials and developers favor a “village type” area with housing, offices and shopping that promotes pedestrian access — or at least access where a car could be parked and where shoppers would want to walk from store to store. Both proposals aim to accomplish that, Attorneys Bruce Hill (for Federal Realty) and Robert Maslan (for the Palmer family) said in their presentations. The main entrance to the Federal Realty property from Heights Road, VERY roughly where the entrance to the Stop & Shop parking lot is today. The small building in the front on the far right might be a coffee shop across a small (raised) plaza from other buildings. Building height would increase closer toward the center of the property. 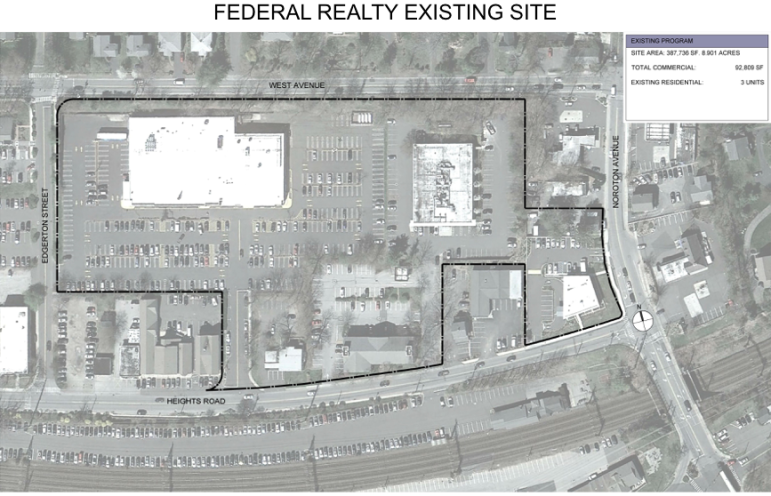 Aerial view of the current Federal Realty property (including Stop & Shop and Equinox buildings) and Chase Bank property. Proposed new buildngs on the Federal Realty site, in light purple, dark purple buildings (where Equinox, Citibank and Chase Bank are today) are in dark purple. A view down West Avenue (looking southwest) with the lowest parts of buildings closest to the street. The buildings get higher the farther they get from the street. In one of the biggest changes to the Federal Realty proposal, a main entrance to the property will not be on this corner of West Avenue and Edgerton Street (here, looking southwest) but closer toward the middle of the block on West Avenue. 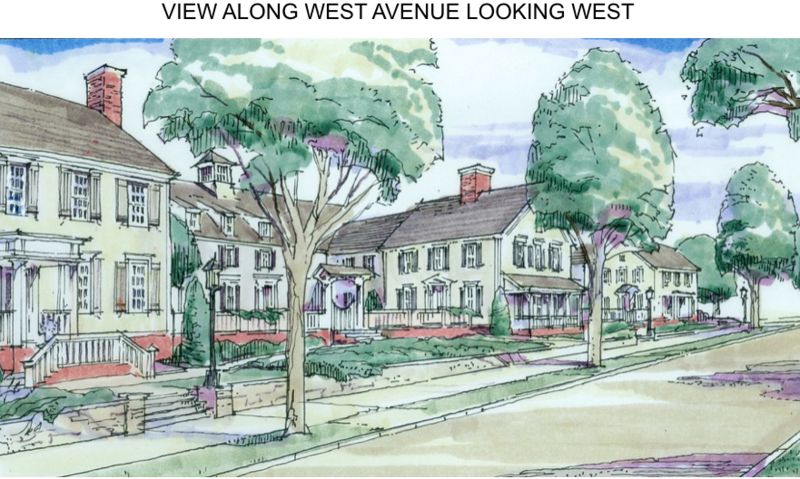 The buildings on West Avenue are meant to look like traditional-style homes. The first floors are higher than the streets. People's Bank would be to the right, across Edgerton Street. 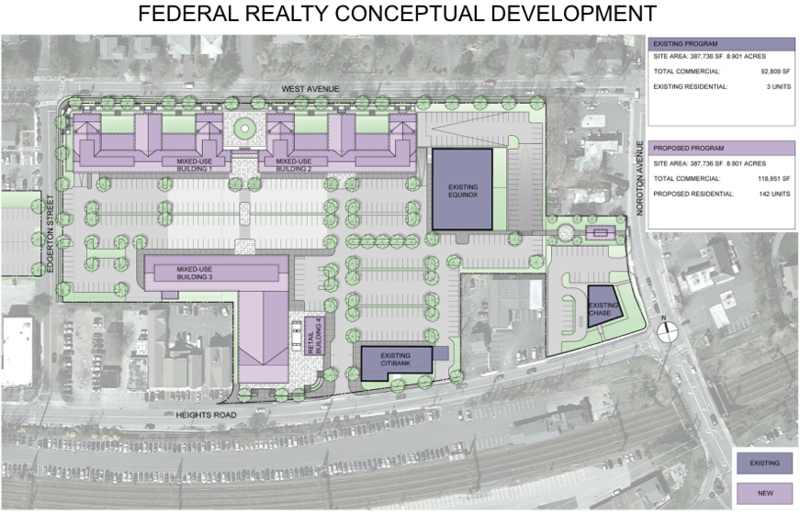 The main pedestrian entrance to the Federal Realty property on West Avenue would look like this, with a four-story building connected to another one by a bridge, and both four-story areas set back from West Avenue. 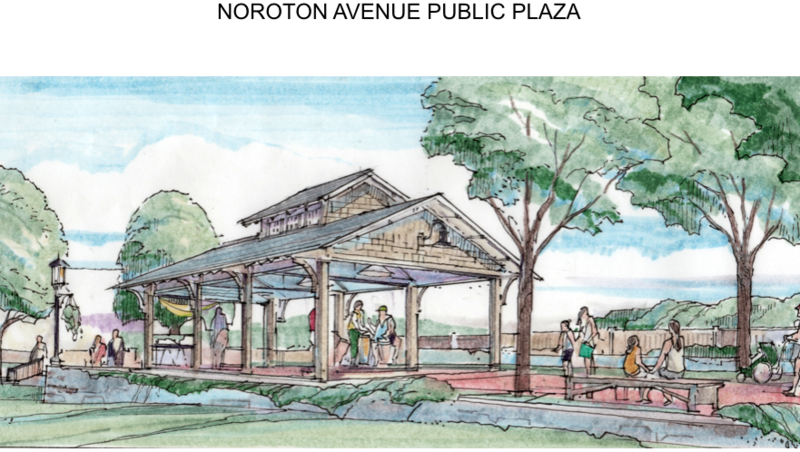 A new part of the Federal Realty proposal is a pedestrian entrance from Noroton Avenue. This view looks northwest. In fact, a small car repair shop would be in the background on the right, as planning board members pointed out. This entry would be just north of Chase Bank. Editor’s note: When the Darien TV79 video of Tuesday night’s meeting is posted online, we’ll add it to the bottom of this article.